Aside from the ability to tell the time, which watch component would you say is the most practical? A date window? Perhaps a second time zone or a chronograph? I would say it’s more basic than that. For me, one of the most practical features of a watch is its lume. Do you know the differences between the Chromalight and the Superluminova? An integral component to a tool watch is how well it works in low light. Take the diver’s watch for instance—if it didn’t glow in the dark it would be useless as a dive watch. A diver depends on how legible that watch is in murky waters. The same logic applies to watches worn for other adventures, such as mountaineering or cave exploring. As a matter of fact, a big selling point of the first Explorer watch was its ability to tell the time in the dark, while the Explorer II was positioned as spelunker’s tool watch thanks to its abundance of luminescent markings on the dial. However, even the most unadventurous of us use the watch’s lume all the time. Whether it’s to check the time after waking up in the middle of the night or making sure we’re on time for a dinner date whilst in a dark car, the practicality of a watch that can glow in the dark cannot be overstated. 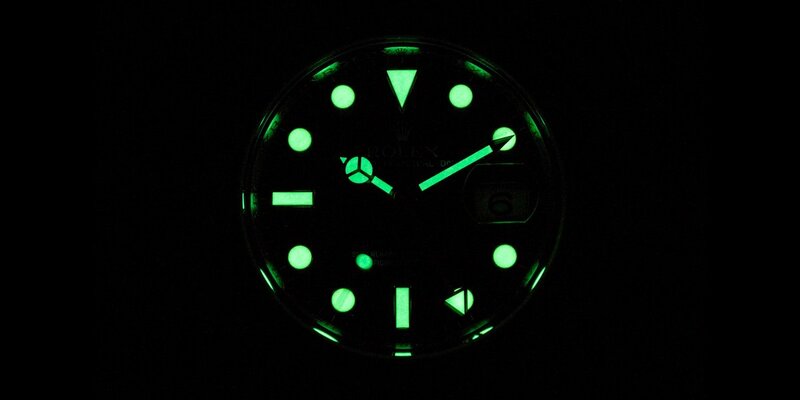 Have you ever wondered why some Rolex watches glow blue in the dark while others glow green? The difference lies in the type of luminescent material used. While vintage Rolex watches first used radium followed by tritium to illuminate in low light, today, modern Rolex watches use Superluminova or Chromalight for luminescence. Read on to find out the similarities and differences between Chromalight vs. Superluminova. 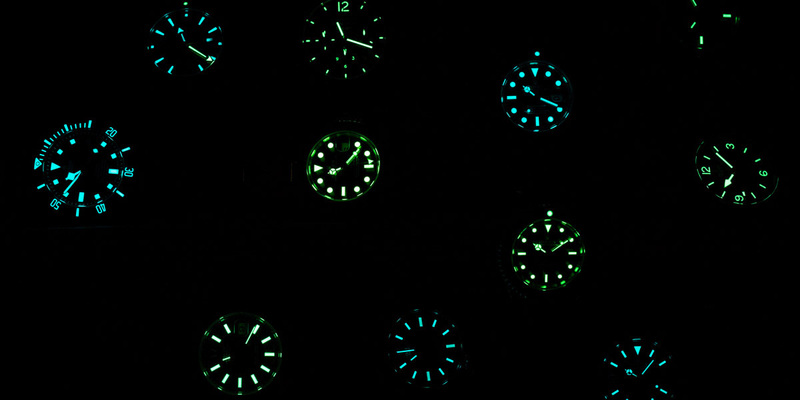 Watches that glow green have the Rolex SuperLuminova. Although Rolex began using Luminova in 1998, the brand quickly upgraded to enhanced SuperLuminova in 2000. Both the terms Luminova and SuperLuminova are in fact brand names for a photoluminescent material. 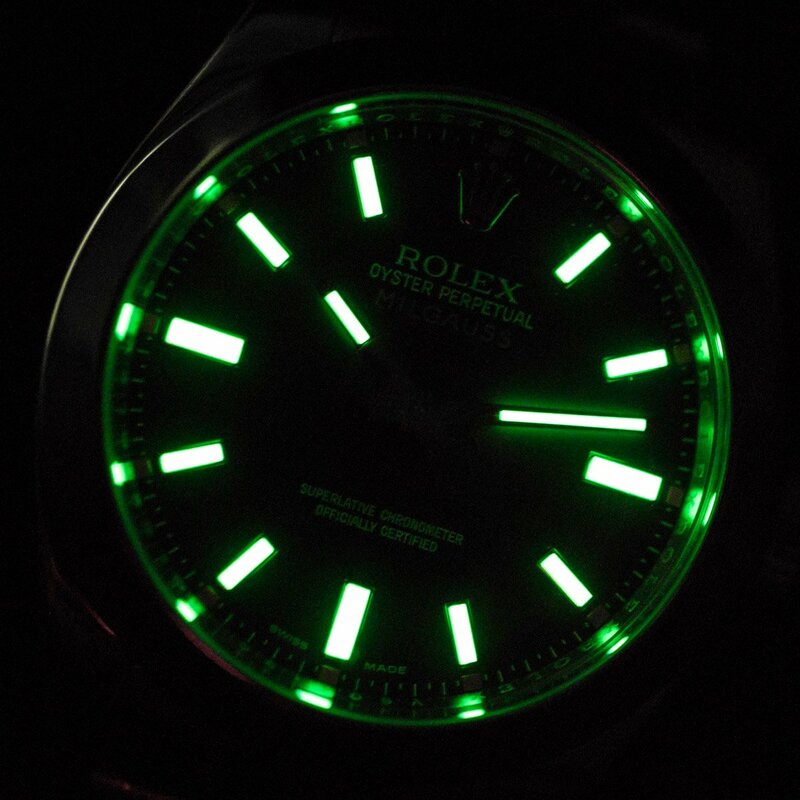 Rolex watches with SuperLuminova details glow green in the dark. Unlike tritium, SuperLuminova first needs to be charged by light to give an afterglow, thus illuminating the face of a watch in the dark. Yet, despite the need to charge first, the big advantage of SuperLuminova over tritium is that it’s non-radioactive and completely harmless. Plus, it doesn’t fade or discolor like tritium—however, some watch collectors actually enjoy the patina of old tritium on vintage Rolex watches. Watches that glow blue have the Rolex Chromalight. In 2008, Rolex debuted the Chromalight display on the Deepsea Sea-Dweller. Although also a photoluminescent material, this time, rather than green, the Rolex proprietary compound gives off a blue hue in the dark. Furthermore, according to Rolex, Chromalight can last up to eight hours, which is more than double the time of other luminescent materials. Following the Deepsea, Rolex began furnishing other sports watches such as the Submariner, the Daytona, and the GMT-Master with Chromalight rather than SuperLuminova. While all current Rolex Oyster Professional watches sport the blue Chromalight display, there are some contemporary Rolex watches that still glow with green Superluminova. Interestingly, some modern Migauss and (now discontinued) Datejust II watches include both the blue and green luminescence. If you’re not sure which lume your Rolex has, the quickest way to tell if your Rolex has SuperLuminova or Chromalight is to simply turn off the light! Regardless of the color, Rolex watches perform perfectly at night and boast a distinct look, even in the dark. Which lume does your watch have? Which lume do you prefer? 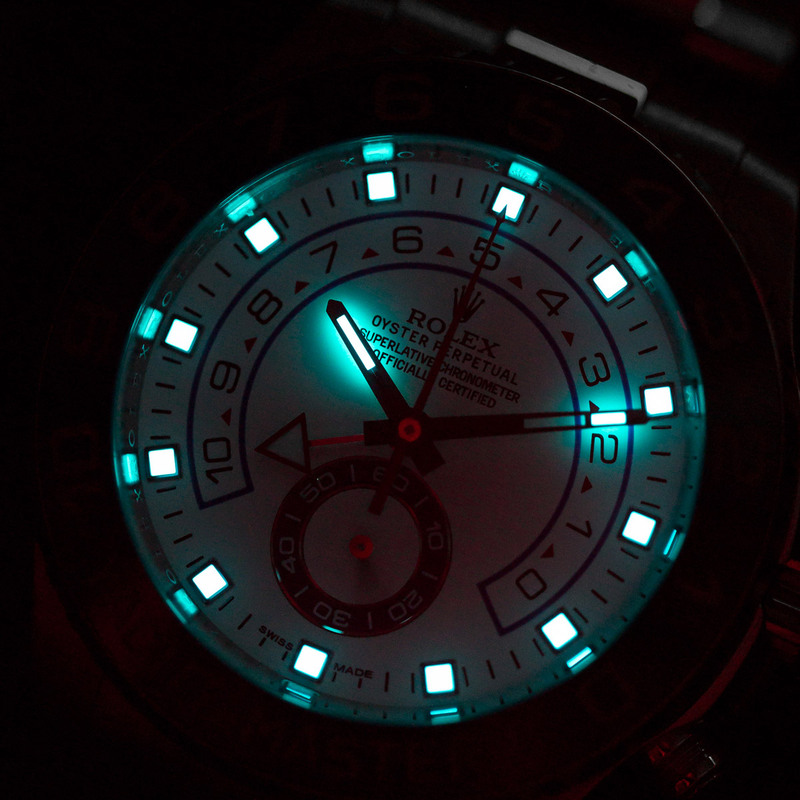 Looks wise, do you prefer your Rolex to emit a green or blue light in the dark? Leave us a comment or lume shot in the comment section below.